Product prices and availability are accurate as of 2019-04-23 14:14:02 EDT and are subject to change. Any price and availability information displayed on http://www.amazon.com/ at the time of purchase will apply to the purchase of this product. 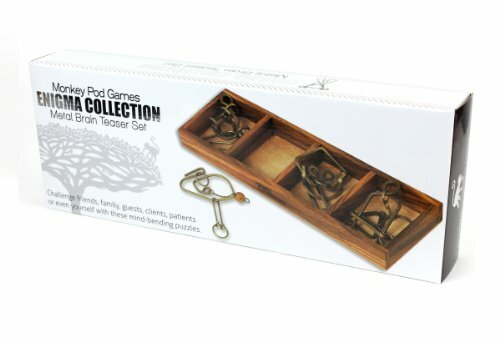 Each of these collections contains a different set of four brain teasers designed to make you think and envision the solution as you twist and turn the parts in an effort to separate the pieces from each other. The Enigma Collection Set I is perfect for the experienced puzzle solver or someone looking to challenge his own puzzle-solving abilities. 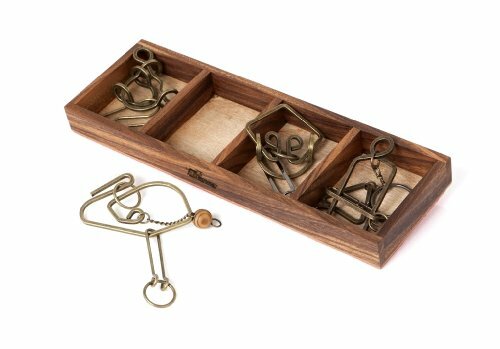 The four brain teasers, each made of brass-plated metal, come in their own artistically designed box, constructed of beautifully hand-crafted wood. The boxes make a beautiful gift or an elegant display of "playable art" whether resting on the surface of a home coffee table, the shelf in an office, or the bedroom desk of a curious and inquisitive teenager. Challenge friends, family, guests, clients, patients or even yourself to pick up one of these mind-bending puzzles. We guarantee none of you will be able put it down until you've achieved the satisfaction that comes with finding the solution! Four brain teasers in an artistically designed box. Perfect for the experienced puzzle solver.